Why some unicode characters are missing in charmap? 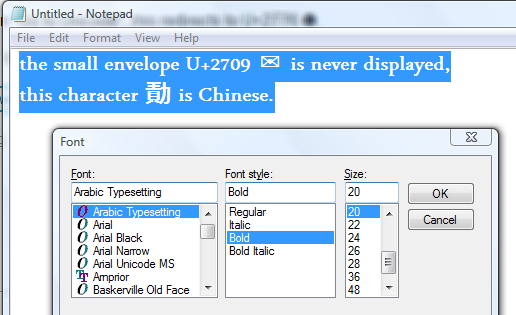 In Windows, Character Map doesn't seem to display all of the unicode characters, even if the selected font supports them, and "Character set" selector is "Unicode". For example, the small envelope U+2709 ✉ is never displayed, even if the character exists both in Segoe UI and in Consolas (at least Visual Studio (Consolas) and a sample web page (Segoe UI) displayed in Google Chrome show both the character correctly). When typing 2709 in "Go to Unicode", this redirects to U+2776 ❶. Why some unicode characters are missing from charmap? Are you sure the characters are in the font? Browsers search other fonts to find missing characters - therefor you cant use browsers to test font contents. You can't trust applications either - here I am using an Arabic font in Notepad to show Chinese characters that I strongly suspect are not in the Arabic font. It seems to me the application (or the underlying Windows libraries) are searching other fonts to provide the missing character. If you need an independent corroboration, you could try FontForge or another third-party font tool. Each application and each operating system can define its own fallback font for any Unicode script range. Microsoft makes an effort ensure consistency across its application and products and includes an API (since Windows 8) to provide preferred font fallback recommendations to applications. The Noto family of fonts uses the [Font Linking] model to create what appears as a single font by combing script-specific font files... Font linking requires specifying the priority of the fonts in linked together as though in a change. A font later in the chain can only add glyphs to an earlier font; you cannot override or replace glyphs in the early font. Font substitution is implemented by an application to replace a request for a font that is not available into one that is available. In general, applications use PANOSE information (a set of numeric values summarizing the font’s style) to find the most appropriate matching font. A composite font is composed of a high-level font that references multiple descendent fonts. It's there in the Ariel Unicode MS Font. check that wikipedia page No need to download a font for it. http://en.wikipedia.org/wiki/Unicode_font to see what fonts support what characters. Not the answer you're looking for? 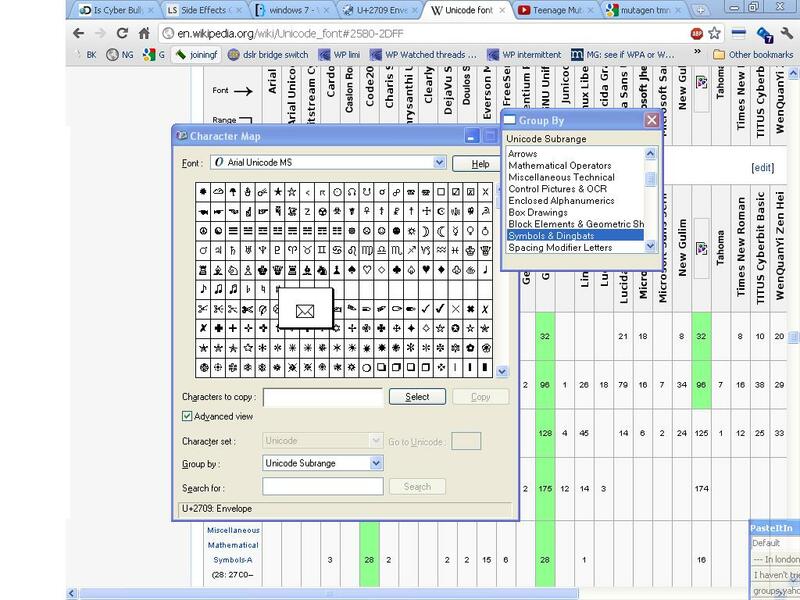 Browse other questions tagged windows-7 windows encoding unicode special-characters or ask your own question. Is there a key combo that's usable for Unicode characters in the same manner as ASCII characters? How to browse a font by characters from a given codepage? How do I find out which font contains a certain special character?